It has been a very positive year and we want to thank you all for the wonderful support and helpful ideas throughout the year. We wish you all a very Happy Christmas & New Year and welcome everyone to continue the efforts to learn more Thai in the new year. We hope you enjoy the festive video below, showing you how to wish your loved ones Merry Christmas and Happy New Year. The word สุขสันต์ /sùk-săn/ is used for gerrtings in any special occasions. I wish you have a beautiful girlfriend. I wish you have a handsome boyfriend. Thanks Mod Happy Holy Christmas. Its the birthday of Jesus that why we celebrate this special day. Thank you khun Michael for your kind wishes. 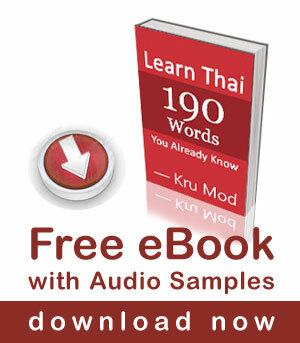 kru Mod, what is the different between sa baai dee bpee mai?, sa wat dee bpee mai? and suk-san wan bpee mai? does it make any different which to use? Anyway just want to say thanks for your dedication and hard work you and kru Pear bring Thai lesson so enjoyable krup. Wish you, your family and kru Pear happy, good health, and Prosper New Year 2014.